Milestone Chicken Food provides your flock with a nutritionally complete blend of locally sourced ingredients. With this top of the line chicken food, Muenster is making sure that whichever comes first, chicken or egg, both receive a nutrient-filled local product that puts their health at the top of the pecking order. Milestone Chicken Food starts with unique proteins. When forging, chickens instinctively know to go after bugs and worms to supply their protein requirements. Muenster starts this highly digestible feed by adding cricket meal and fish meal to help them stay strong and productive. It’s the number one ingredient by design. Next, they add a delicious mix of black oil sunflower seed, alfalfa, and organic peas. The bio-available nutrients help closely resemble what your flock would find in a high-quality pasture. They finish it off with minerals designed for healthy growth and essential oils to support a strong immune system. Of course, what’s not in it is almost as important as what is. Muenster believe’s you need the best chicken feed for the best birds. That’s why they make theirs corn free, soy free, and with only non-GMO grains. 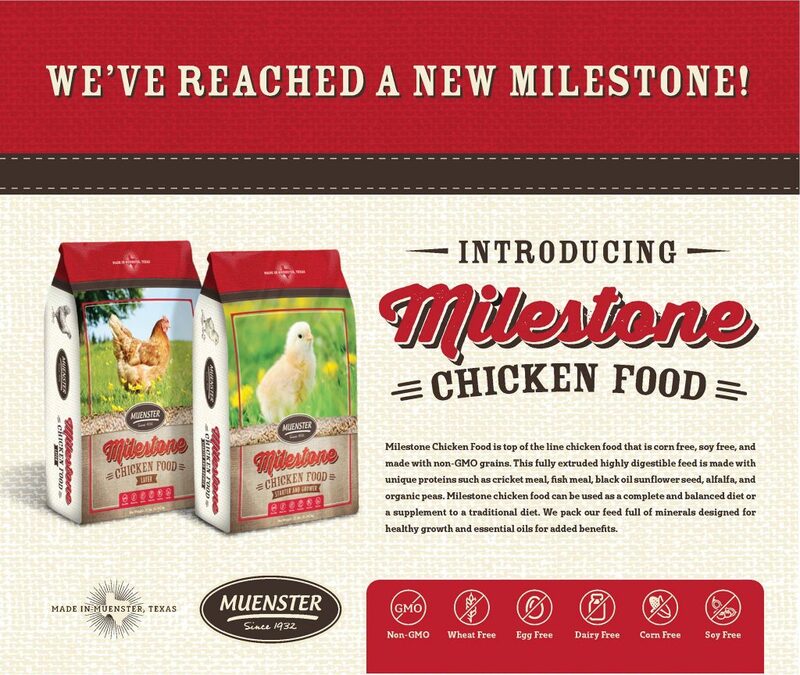 D&L is excited to be offering Muenster’s new, one-of-a-kind chicken feed. Plus, we’re excited to offer a frequent buyer program on it – buy 12 bags, get the 13th FREE! Stop by your local D&L in Aubrey, Celina, McKinney, Gainesville or Sanger to learn more (map our locations).